One of the oldest and most interesting maps of passage in MCPE, working on version 0.8.1 - 0.12.1. You have to go the seven tests and collect all the blocks of wool. Mechanisms of map are based on the conscience of the player. Therefore, play is not fun if you break the rules! The Cave map for MCPE 0.12.1Hardcore CTM-map, where you have to explore all the terrible caves, going through tons of monsters - find two precious wool! Minecraft PE 0.11.0 update previewMojang soon announce the release date of the new version Minecraft 0.11.0 . Alas, all the official information yet. But as always there is rampant fans who are spreading rumors millions! 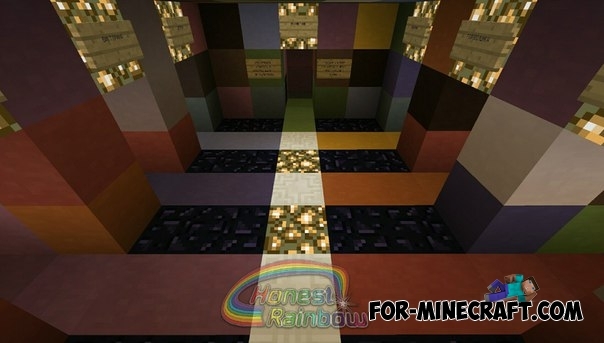 EVASiON map for Minecraft Pocket Edition 0.9.5.2From the creator of maps Portal Of DooM and Rainbow Sprint Parkour! This map is a unique type of maps, which includes challenging puzzles with a unique storyline.